New leaked video naked Bikini Tara Reid 2019!!! 21Sextury free galleries containing photo and video updates from m.
DO YOU OWN THE OLDEST LIVING BIRMAN? One question frequently asked of Birman breeders by prospective kitten purchasers is: "What is the average age of a Birman?" Evidence from obituaries published over the years in the Club's newsletters and magazines suggests that it is around 12 to 15 years, with some cats sadly succumbing to kidney failure at this sort of age. Research into our veterans originally arose in Summer 2004, as the result of an e-mail from the owner of Charlsim Mistral, a 17-year old Seal male, who was interested in finding out if he had reached a record age for a Birman. My own first Birman had died two years earlier at the age of 18 and I found evidence in plenty that many Birmans live as long as this, others achieving 19 and 20, and just a few 21-year-olds. Read all their details in the Veteran Record Book below! At that time I had not been able to find a Birman that had reached the age of 22 but, following the launch of our Veteran Birmans feature on the website in September 2004, among the Feedback responses from owners of very senior Birmans was news of two who had lived to this amazing age, a Blue point male and a Seal point female, resulting in a new Year Age heading for our Record Book. A 22-year old Blue point living in Norway, Charmy of Ontario, died in November 2007, making him the third oldest Birman at that time. In July 2007 Shandatal Cleome "Minx", a Blue point female, had also reached the age of 22, and a year later we received the wonderful news that she had broken Birman records by celebrating her 23rd birthday. Very sadly, however, Mix died shortly before Christmas 2008, but she is still just the oldest known Birman, now joined by another 23-year-old, Pepsi, who lived to a few weeks younger. So now we are looking for any Birmans who have broken this record, and would love to hear from more veteran owners and in particular anyone who owns or has owned a 24-year-old - or older! Just click on the Golden Paw to e-mail us, with a photo if you have one. Please say if it will be OK to include your e-mail address link on the Feedback letters page, as other interested veteran owners and the Magazine editor may like to get in touch with you. Older letters are removed periodically and entries created in the Veteran Record Book where appropriate. If you have written before, we would very much welcome an update on your Birman senior citizen. to tell us about your 18 plus golden oldie Birman click on the golden paw! Now read on into our Veteran Record Book - a fascinating cross-section of show-bench stars, pedigree names and much loved pets. To read the latest letters from owners of veteran Birmans, click here, or on the Veteran Feedback link at the end of the Record Book. Our special thanks to John Assiter-Tuppen for his drawings to illustrate this feature. Here are some Birmans known to have lived to these advanced ages. Many were show and breeding names appearing on many pedigrees, but some were beloved pets. She was owned by Margaret Richards (Mei Hua) and, as a daughter of Paranjoti Kuomintang and granddaughter of Orlamonde de Khlaramour (as well as both daughter and grand daughter of Ch Nouky de mon Reve) she was a last link with Elsie Fisher, and she lived to the age of 16. Stud cat first exported by Betty Brown to New Zealand and then owned by Colin McKenzie in Australia where he sired many champions. Owned and bred by Betty Brown and sired by one of the old-time greats Ch Pipo du Clos Fleuri, Leona Chinka was litter sister of Thai Phong and another granddaughter of Orlamonde, from Ch Paranjoti Kimsallie. She died late 1985.
a very famous stud "on every good Birman's pedigree" who was bred by Mrs Reading and spent most of his life with Christine Dyer (formerly Shattock) of Snowqueen Birmans. A stud who is behind so many pedigrees (through his daughter Ch Arbaybi Sovereign and also a Seal point son, Menelik Quinquirima), "Jojo" was bred by Joyce and Bob Worth, was owned for many years by Jean Park (Arbaybi) and from 1988 lived with Trish and Bryan Merrett (Lapermier) until his death at over 16. A Dearing Boy Sioux daughter, bred by Jean Park and owned by Helen Cross. Lovely breeding queen owned by Pam Collins (Dubrova). A son of Ch Solomon von Assindia and Ch Paranjoti Kimsallie owned by Clive and Katherine Freeman (Saxongold). Bred by Pat Blair, owned by Betty Brown and happily re-homed her when her breeding days were over. a daughter of Solomon and Leona Chinka, and mother of Pr Smokeyhill Chun Fay, she was another of Betty Brown's queens successfully re-homed, living a happy life with Mr and Mrs Chant. Famous stud in many many pedigrees who spent his last five years as a neuter, bred by Mrs Denham and owned by Joyce Price (Tamandria). He died a couple of months short of his 17th birthday. the first Champion and "number one companion" of her breeders David and Rita Redtfeldt. Gr Ch & Int Pr Belleview Francesca and Pr Belleview Natalie were among her titled offspring. "Socks", sired by Ch Attimore Tanglepaws Tor, was the beloved first Birman of Hazel and Keith Jinks. They had to say goodbye to him on a sunny day in 2000. A Dearing Boy Sioux daughter, "Chloe" was from Carol Brazil's (Khaochi) first litter, and a devoted mum to her babies and everyone else's. Melvas Macbeth (SP male, 15.6.85 - 7.2.01): "Luke", owned by Gloria and Des Thornton, was one of a "Shakespearean" sextuplet litter born to Melva Eccles's Pr Belleview Natalie. daughter of Alannah Music Man (another 16-year-old). Bred by Kathleen Wall, and owned with joy by Maureen Probert. Bred and owned by Kathleen Wall, "Manny" lived as a much loved pet after 10 years as a stud and passed away 2 days after his 16th birthday. His brother and lifelong companion Alannah Chief Singer survived him by 6 months and then went to join him aged 16. A successful show neuter alongside his litter brother Pr Fevrier, owned by his breeders Elaine and Fran Tandy. A Ch Attimore Tanglepaws Tor daughter who had many lovely kittens for her breeder owner Pat Sandford. The great "Birman Ambassador", Overall Birman Show Best in Show 4 times and Overall Top Birman for the year 3 times, Berlain was bred by Charlie and Isobel Keenan and owned and treasured by Liz and Dougie Taylor. Betty Brown's beloved stud, the last son of her famous import Ch Solomon von Assindia who is on countless pedigrees. Luby was one of a long line of "old" Birmans and is much missed by Helen and Jo Carter. She had a head injury from a young age which left her with disabilities but in her own environment she flourished as the boss. Willow was a once in a lifetime cat who was destined for the show bench right from day one. She just knew how to woo the judges and rarely failed. When the Imperial titles came into being, she dusted off her paws and came out to do her stuff again, and gained her 5th Imperial Certificate at the age 14.5 years old. She ruled the household quietly but effectively and that included us, her humans, she had us all very firmly under her paw. She very nearly made her 17th birthday and is so sorely missed. Tiko was owned by Andrew and Ruth Knock in Scotland and bred by Joan Gilmour. Sadly died 6 days short of his 17th birthday. Ch & Pr Klassyklogs Kougar (Cream point Male 14.6.97 – 27.8.2013, Adinnlo Cinnabar Rueben x Ch & Gr Pr Klassyklogs Kalendula). Kougar was one of many beautiful Red Series Birmans bred by Jane Tackley and was given to her brother and sister-in-law Stephen and Jill Bunce as a lovely birthday gift in late 1997. He quickly settled in with their other "Klogs", became special friends with their famous Red boy UK Gr Pr Klassyklogs Klaus, and enjoyed a successful show career as both Adult and Neuter. He went to Rainbow Bridge on his birthday, just making it to his 16th. Imp Gr Ch & Gr Pr Lingcomb Snowwitch Trojan "Troy" (Seal point male 22.02.2002 - 20.09.2018, Adhirlo Cosi fan Tutte x Lingcomb Candace) bred by Janet Osborn and owned by Claire Finch. At 16.5 years Troy lived to above the average age for a Birman stud cat and he sired some beautiful and outstanding kittens, including the famous star Gr Ch & UK Olympian Gold Imp Gr Pr Tarkusha Helenoftroy, Gr Ch Snowwitch Kingdomofsummer, and litter sisters Gr Ch Snowwitch Mistsofavalon and Gr Pr Snowwitch Lingcomb Astraea. After being neutered in 2010 and living the life of a contented house cat, he continued to impress judges on the show bench with his size and substance until his retirement. a famous name as she was one of the first litter of Birmans born in the UK (to Ch Nouky de mon Reve & Orlamonde de Khlaramour), bred by Elsie Fisher and Margaret Richards. bred by Vivienne Creasey-Smith, owned by Julia Heffernan and died as the result of a road accident at nearly 18.
bred by Elsie Fisher and owned by Louise Denby in South Africa , died from a fit in 1991. Well-known winner in her day, owned byJoyce Price (Tamandria) and bred by Mrs Giles. Britain's first male Grand Champion, Tamandria Truffles was one of her titled sons. Foundation queen of Carole Flynn (Laurant), "Sapphire", who lived to nearly 18 years old, is in many pedigrees. Famous boy owned and bred by Gwen Tapsell. "Wishy" was Best in Show Adult at the 1984 Birman Show and died in Summer 1998. Owned and bred by Jane Izzard, this well-known stud lived to just over 17. His mother, Vanbelma Phersephoni lived to about 18. Athene was from Carole Flynn's second Laurant litter and was the mother of Gr Ch Laurant Sugar Dandy and others in our pedigrees. Much loved companion of Alistair and Pauline Munday. "Zeita" was Carol Brazil's second breeding queen who produced several Champions and Premiers for her Khaochi prefix. Tazmin, sired by Sahra Sebastian, was the first Birman owned by Jane Tackley (Klassyklogs) - a girl of character who slept on her doting owner's head! Jane lost her a month short of reaching 18. Sired by Ch Cheratons Maximilian, Maymyo produced many kittens for Anne Madden's Panjandrum prefix, including Grand Champions Ko Chang and Shogun and is in many pedigrees. The first Blue-point female bred by Anne Madden and therefore a special girl. She was a daughter of Ch Panjandrum Brocade by Ch Laurant Coeur Delyon, and mother of another lovely Panjandrum Blue point, Gr Pr Amaryllis. "Monty", bred by Mrs Gallimore and owned by Jan Beaumont, was one of the original Lilac Birmans, from Shwechinthe lines, and as the sire of Ch Jandora Stagedoor Johnnie, is on many Lilac pedigrees. He was put to sleep 4 weeks before his 18th birthday. a spectacular neuter very like his famous sire Ch & UK Gr Pr Melvas Romeo, bred by Shirley Talboys and owned and shown by Mrs Gloria Peterson. "Digby", owned by Alison Jarman, was one of a good many Birmans who suffered kidney problems in mid-life but lived on to a good old age, when he became very arthritic and developed a problem with co-ordination. He died in October 2004, aged 17 years and 10 months - a son of a famous father, Gr Ch Charlsim Wishcumtru who also died at 17. "Jessie" was sired by an early Chocolate point, Namrib Okidoki, and was one of the first Lilac Birmans on the show circuit. She was owned by Mr and Mrs Hague of Sinhchat Birmans and her some of her kittens went far and wide: to New Zealand, the USA and Norway. "Tia" and her Chocolate point half-sister "Shashi" (Lohteyn Shashisha) went to live with owner Anne Edis when they were 3 and 4 respectively, lively and idiosyncratic girls whose mission in life was to "become ladies of leisure and to train another human in the art of looking after Birmans". They entered the Club's Pet Birman of the Year Awards in 2006 and very narrowly missed being one of the Runners-Up. Shashi had to be put to sleep following a stroke in May 2007 at nearly 16 years old, and Tia, missing her sister, gradually became frailer and was also gently put to sleep when life became too much of a struggle. 'Piglet' owned and bred by Vivienne Lee - Kalemyo Birmans. Very proud owner of 1 UK Gr Pr and 1 Imperial Gr Pr certificate. Bred by the Handscombs, by Snowqueen Lilac Legend x Phambala Belle Blue). Mouji was a cat with a sense of humour and loved to answer back. His favourite past-time was being combed. He was just 2 weeks short of his 18th birthday when he died peacefully at home, he had suffered with arthritis and balance problems. Mouji was the last of a pair of Birmans, his half sister, Sabra (bred by Shirley Talboys) dying at just 10 years with a tumour. He was an extremely affectionate cat, missed so much. Harry and his brother Billy, who survived him by 2 years (see separate entry), were bred by Nuala Leyton (Jasanbo Birmans) who had emigrated with her cats from the UK to Australia where she bred at the Jazzanbo Cattery; their parents were English Champion Jasanbo Jacaranda and Panjandrum Gilded Lily. These loving boys are sorely missed by their devoted owners Susan and Desmond Coop of Perth, Western Australia. Bred by David Thomas and owned by Anne Madden of Panjandrum Birmans, Delph was a massive gentle boy who sired many show-bench stars, passing on his excellent size, type, eye colour and temperament, and is thus in many pedigrees. He gained two Challenge Certificates but did not quite manage the third one to make him Champion. Some famous daughters include UK Gr Ch & Pr Parryanne Minsin and her sister Ch & UK Gr Pr Parryanne Portia (both Blue Tabby), Gr Ch Panjandrum Amaryllis (Blue), Gr Ch Panjandrum Jemima (Seal Tabby, Gr Ch & UK Imp Gr Pr Panjandrum Narnia and her litter sister Gr Ch Panjandrum Nebula, and UK Gr Ch & UK Imp Gr Pr Tarkusha Zinfandel (all Blue). Napoleon and his Blue-point brother Adouzlo Boromir (a.k.a. Ducha Wellington) were sired by the very well-known Aberogwr Delph and, as Rescue Birmans, they went to live with Gill Clarke in 2006 in rural South Wales, where they were loved to bits. Napoleon is very much missed by brother Ducha (Dooka) and his devoted owner. UK Gr Pr Adqualo Fussy Flissy and Adqualo Klassy Kassy (Blue point Females born 28.12.95, Ch Shandatal Cristo Columbus x Nustoal Reanna Tiana). These loving litter sisters, bred by Mrs D Lively and owned by Nicky and Mark Butler, went to Rainbow Bridge within a few months of each other, "Holly" (Klassy Kassy) on 19.2.12 and "Angel" (Fussy Flissy) on 25.7.12. Lizzara Fifi Trixibelle (Blue Tortie point female 10.10.85 – 29.12.2012, Ch Lizzara Bugssen x Nighteyes Scarlett Lizzara). Fifi was a wonderful breeding queen for her breeder and owner Ginny Black and was the mother of four litters. Gr Ch & UK Imp Gr Pr Panjandrum Narnia(Blue point Female 9.4.95 – 31.1.2013, Aberogwr Delph x Panjandrum Princesa). Bred by Anne Madden, "Nani" was an exquisite, loving and beautifully mannered girl who was on the show bench for 12 of her nearly 18 years and achieved much for her adoring owner Janet Osborn. She leaves a Birman legacy through her grandson Imp Gr Ch & Gr Pr Lingcomb Snowwitch Trojan. Tarkusha Isabella (Seal point Female 11.9.96 – 25.9.2013, Gr Ch Tarkusha Princeofthieves x Tarkusha Domino). The constant loving companion of her breeder owners Carol and Geoffrey Tarr, Isabella enjoyed going into the garden with them to lie in the sun, eat a bit of grass and watch the fish being fed – their little shadow, in their hearts forever. Countrycats Great Harry "ERIC" (Seal point male 29.7.98 - 6.7.2016, Gr. Ch. Mandessa Simply Cholac x Arobekah Cashmera Rose). Bred by Angela Clements in Hertfordshire, Eric lived in the family of Maria, Svetlana and Nickolai Solechnik for 17 years. Eric was the most friendly and sociable cat, greeting guests at the door and spending time with the family during meals, evening TV watching and DIY activities. Eric was a loved family member and the whole family was devastated to have to say good-bye to him. He sadly passed away just three weeks before his 18th birthday, leaving a huge gap in the owners’ hearts, and will be buried in the family garden. UK Imp Gr Ch & UK Imp Gr Pr Shwechinthe Shwenat "Nat" (Chocolate point male 31.03.1999 - 19.02.2017, UK Gr Ch & Pr Shwechinthe Pericles x UK Gr Ch & UK Gr Pr Shwechinthe Zunetra) owned and bred by Mrs Elizabeth Brigliadori & Dr Kathryn Robson. Shwenat's great age of nearly 18 years could be a record one for a Birman stud cat and his show record was equally impressive, echoing that of his famous parents. He was the first and, as at November 2018, is still the only male Birman among a select group of 5 cats to have achieved double UK and Imperial Grand titles, as Adult and Neuter. Sarah had about 50 kittens for her breeder owner Helen Dunham and was put to sleep just a few weeks before her 19th birthday. Went to Denis and Jean Bean (Romford) in New Zealand to help the breed in the early days, and died peacefully of old age. A queen on many pedigrees who was owned and bred by Joyce and John Wren. Tansy's daughter Ch Belfalas Beshlie is believed to have also lived to over 18 years old. "Sophie", bred by Vivienne Creasey-Smith, was owned by Anthea Stewart. Bred and owned by David and Rita Redtfeldt, "Franny" was the first female Birman in Britain to become a Grand Champion. She later went to live with Jan Clarke (Mainelite) who showed her as a neuter and she featured in the Club magazine's "A Toast to Golden Oldies" in 1998 at the age of 18. We have no later news of her, having lost touch with Jan Clarke. "Kerry" shared his 18 years of life with Jean and Michael Triggs, until December 1999. A daughter of Ch Solomon von Assindia, bred and owned by Katherine Freeman, Drusilla was Best in Show Female at the 1983 Birman Show. She spent the last years of her life with Betty Brown, living until Summer 2000. A daughter of Anne Madden's lovely foundation queen Ch Sayella Belinda by Ch Attimore Tanglepaws Tor, Brocade also achieved a Best in Show at the Birman Show and has many well-known descendants, including her daughter Ch Panjandrum Fleur. Bred by Heather Horton and owned by Pat and Bruce Forsyth, "Kiki"'s most distinguished offspring is Gr Pr Tharawaddi Kyankse, by a mating with Gr Ch Tamandria Truffles. Owned and bred by Christine Dyer of Snowqueen Birmans, this son of Ch & UK Gr Pr Melvas Romeo and Snowqueen Siouxsie always had his father's wonderful coat and good eye colour. Adixilo Baroness Mishka (SP female 26.3.88 - 10.1.05) and Pr Adixilo Lord Wizard (BP male 26.3.88 - 3.8.06). "Max" , "Boots" (who was only a few weeks short of 18) and her litter brother "Lion" were all bred by Claire Finch (Snowwitch Birmans prefix) and were sired by her stud Ch Sandriana Master Merlin. They were shown in the Home Counties when young, and for the last few years lived in Cyprus with owner David Shaw. Rehomed to join her mother. Both girls who never had a days illness, and are very much missed by Stan and Jean Giles. Mei Hua Antigone (SP female 31.5.71 - 16.12.89): One of the many offspring of the famous Ch Solomon von Assindia, "Tiggy" was given to her owner Chris Wilson as a pet by breeder Margaret Richards "because she knew I was besotted with cats", along with companion "George" (Mei-Hua Pygmalion) who only lived to 13 years old. "Sparky" was still on the show bench in top form, only weeks before his deat, still winning Open classes, PCs and even two Reserve Imperial Grands in his 17th year - a truly remarkable cat and a legend in his own lifetime. A much loved companion sadly missed by his owner Amanda Law. A beloved pet who, with his mother, was also known on the show bench in the early 1990s. He shared his life with devoted owner and breeder Jenny Mitchell, and with his mother Darwill Aphrodite who died in March 2003 at the age of nearly 17. Sophie's parents were Heathfields Million Heir and Adixilo Andromeda. She lived her long life with Linda Shergold and until becoming ill with kidney failure in her last year she had as much energy and enthusiasm for life as a kitten. She was peacefully put to sleep in Linda's arms just a few days after her 18th birthday, and is grievously missed. was owned by Pattie Hodgson who says that her nature matched her name and she will always be missed. Sebastian who passed away in August at the age of 18 was our Beloved pet chocolate point and a finer cat you would not find anywhere. He had been ill for over 12 months but was so dignified with the way he dealt with it. We lost his brother Christian when he was only 8. We were devastated to lose Sebastian and he will never be replaced, although we now have 2 more chocolate point kittens who are now 6 months old and hopefully they will live to a grand old age. RIP Sebastian, the best cat in the world and always will be. Antonio Tandaloo "Sam" (BP male, 1 August 1989 - June 2007); Owner David Crawford writes that Sam didn't have owners, he had staff. He liked to run a tidy household, a firm but fair boss to Mother aka Chef, Dad aka Chauffeur, Sister Maid and Me Butler. Often entertained by a knitting needle, a marble or a ball of wool. Triggers parents were UK Gr Ch Mockorange Big Boy and Sandriana Shabanna; he had a twin brother called Rodders who we unfortunately lost at 14 months to FIP. Trigger became an only ‘child’ and had a long happy and pampered life with his mum and dad with occasional sleepovers with nan when it came to holiday time. Trigger was diagnosed with CRF in July 2008 and was sadly put to sleep after suffering heart failure on the 20th July 2012. Trigger has left a massive hole in our lives. Ch & Gr Pr Lizzara Moonpearl(Seal Tortie point Female 28.10.94 – 17.12.2012, Lizzara Dreanwarrior x Nighteyes Scarlet Lizzara). Bred by Ginny Black, her "Mou" was a larger than life outgoing, chatty girl who loved going to shows and adored all the attention that went with it. Aduelo Kitchis Sulakoo "Sula" (SP female 27.07.1984 - 02.02.2003, Ch Attimore Tanglepaws Tor x Adonelo April Kitchikoo). This greatly loved, never forgotten and stunningly beautiful girl lived with her devoted owner Fran Torode for 18 years and was shown at several cat shows in the Channel Islands. Elfreda Emily (Blue point Female 8 2.95 – 24.3.2013, Nischa Spenser x Mapuzzee Sharna). Emily and her Seal point litter sister Charlotte (with whom she is pictured) lived happily with Sylvia Bazley in Australia from 12 years of age when their original owner could no longer care for them and it was love at first sight for all of them. She passed away 6 weeks after their 18th birthday and Charlotte joined her in March 2015, 6 weeks after celebrating her 20th birthday with Sylvia – see separate 20 Years entry. Pr Urprity Qualos (Blue point Male, 4.9.95 – 1.2.2014, Ch Panjandrum Orian x Tandalao Mintz). Bred by Molly Perchard in Jersey, "Beau", a very loving and vocal boy, joined Janet Osborn as a kitten the same summer as Gr Ch & UK Imp Gr Pr Panjandrum Narnia, born 5 days later (RIP January 2013), and they became special companions all their lives, shown together until Beau was retired and nearly always sleeping together. Janet had to say a sorrowful goodbye to him two months short of his 19th birthday. Panjandrum Volterre (Blue Tabby point male 31.7.96 - 9.9.2014, Aberogwr Delph x Terglo Temptation). Bred by Anne Madden in Oxfordshire, "Big Boy" and his sister Beauty who died young were initially owned by Joan Ashford and then after her death Big Boy lived with Joan's daughter Dr Sally Mason for 10 years. When young he would fight any cat entering his territory, and he welcomed guests at the door, demanded attention, knew when family members were returning home after days away and met them up the road, etc. Sadly, in old age he became a shadow of his former self in chronic kidney failure, suffering hypertension and a period of visual loss, hardly able to hear in the normal human range and very vocal. Sally and her family were astounded at how long he was with them and much a part of the family he was, and were devastated to have to say goodbye to such a character - "more like a person than any cat I have ever met" - just over a month after his 18th birthday. He is buried in their garden next to another puss, with a large circular stone with N, S, E and West on it (a reference to W H Auden's poem). Bred by Linda Steven. Beloved companion of Juliette, Margaret, Rally and Greg. Outlived by his litter brother, Robbie (Rishabha Robin Hood). Lover of shoes, rump-patting and butter. He was known to forward somersault onto his back for tummy rubs. During the last 12 months of his life he had CRF, weight loss and megacolon, however, he kept his appetite till the very end. Rest in peace lovely sweet Willie. Candy was a perfect breeding queen with her lovely Birman type and happy confident temperament, and a wonderful mother to her four litters of kittens, which included two well known big Seal boys: UK Imp Gr Pr Lingcomb Endymion "Sunny" and Claire Finch's Imp Gr Ch & Gr Pr Lingcomb Snowwitch Trojan "Troy". She has left her Birman legacy through Troy's offspring. Her poor feet markings (no gauntlets!) precluded showing, but she did have one day of glory after being spayed when she was Best "Fireside" (Birman Pet) Exhibit at the 2006 Birman Show. Her sweet gentle presence is much missed by her owner and breeder Janet Osborn and the little family of feline descendants she leaves behind at home. Isolde, bred by Mrs Elsie Fisher and Mrs Margaret Richards, was one of the first litter of eight Birman kittens born in Britain, from the first two imports Ch Nouky de mon Reve and Orlamonde de Khlaramour, and was also the first British-bred Birman to produce kittens. Her home was with Mrs Richards and she lived to 19 years of age. Famous stud boy bred by Mrs Ward and owned by Carol and Ron Pike (Caroona), "Toby" was the sire of several Grand titled cats both in the UK and overseas, including Gr Ch Patwick Sam Weller and Grand Premiers Lastmor Solitaire and Caroona Celestial Sultan. Sophie was from the first Sandriana litter of Sandra Moore - her "beginner's luck", and she too featured in the magazine's Winter 1998 "Golden Oldies" when she was then 17. Her offspring include Ch Sandriana Sweetheart and litter bothers Ch Sandriana Master Merlin and Gr Pr Sandriana Regency Raffles, with many titled cats among her grandchildren. Foundation queen of Elaine and Fran Tandy (Tandalao), "Minsin" was the mother of their litter brothers Premiers Tandalao Fevrier and Finzi, Molly Perchard's foundation queen Tandalao Mintz and Janet Osborn's girls Gr Pr Tandalao Esterhazy and Ch Tandalao Elektra. She died only few weeks short of her 19th birthday. "Chloe", a Ch Attimore Tanglepaws granddaughter, was from the first litter bred by Ivy Perry (Starramia) and was the mother of Ch & Pr Starramia Sunsation and Ch Starramia Daydreamer. Stud boy who lived with Pat and Bruce Forsyth in Scotland from 4 years old. "Cinny"'s most famous son is Kathy Evans's Gr Pr Flash Tyson who is himself now 19 years old. "Tubbs" was from the first Starramia litter of Ivy Perry and was the first Scottish-bred double titled Birman. He was always a big heavy cat until his last two months when he lost weight alarmingly and, like his mother, he died in his 20th year. Angel was bred by Mrs K Lilley and owned by Patsy and John Knight. They also owned her litter brother Rolfkabo Blue Aylmer who predeceased her, and their sire was a very well-known boy, Gr Ch Charlsim Wishcumtru (see under 17 years). Devoted owner Sue Day lost her very special pet Birman at the age of 19 years, 1 month and 1 day after a long battle with kidney failure and old age. He shared several traumas and house moves over the years. A very dainty girl with a lovely nature, owned by Jackie Edmunds, who had to be put to sleep following a major fit. Her parents were Gr Ch Bartina Tobias and Snoshu Blue Rhapsody. Sired by Ch & UK Gr Pr Melvas Romeo, "Fabs", as he was known to owner Geoff Wright and his family, loved being in company and was very active in his veteran years, only sleeping 4-5 hours a day and enjoying mad dashes across the lawns and flower beds of their garden. Daisy (sired by Shirley Talboys' Ch Shandatal Blue Danube ) was the first of three Shandatal Birmans who went to live with Martin and Sylvia Patrick near Stratford-on-Avon, and she outlived them all. She kept a lovely pale coat but, like a number of elderly Birmans, became a little deaf. A loving pet owned by Malcolm Waters, bred by Mrs Read of St Austell in Cornwall. He had kidney and arthritis problems as an oldie, but still enjoyed a good appetite. He had to be put to sleep at 19 years 9 months due to loss of mobility. Tyson was bred by Mrs Tina Heaven and proudly owned by Mrs Kathy Evans. He was one of the first half a dozen Seal Birmans to become a Grand Premier, and achieved much fame by appearing at many shows on exhibition in his miniature boxing ring (complete with little boxing gloves), including at the first UK Pet Show at Earls Court in London. He appeared in many newspapers and magazines and was made an honorary member of the Mike Tyson fan club! Louis arrived as a rescue at our home because he sprayed. We never meant to keep him, he should have gone to a sanctuary, but we have had him since he was twelve. Louis retired from public life in 2005; he regularly appeared on the Birman Cat Club rescue stand and helped raised the profile of rescue work. He loved John, and we shall miss him treading in the coffee cups! also he loved sauce and anything off the edge of your plate. "Zippy" slipped away in February 2008. He had spent 11 of his almost 20 years with Phil and Sue Hart and his younger brother "Bobby" (Shandatal Rupertino). "Bobby" had always lived with his older brother "Zippy" and both of them almost reached 20 years of age. Very much missed by Phil & Sue Hart. "Pippin" joined Melva Eccles back in 2001 when he was due to be put to sleep due to kidney problems and fits aggravated by 'slight sounds'; he almost made it to 20 years of age. Nicola was Patsy and John Knight's first Champion and from their first litter registered with their prefix. She enjoyed the garden in her senior years after retirement, as well as her food - eaten on the work surface! She died only a few months short of her 20th birthday. 'Dior - Grannie Grotbag' Bred by Wendy McQuilkin owned by Vivienne Lee - Kalemyo Birmans. Gently put to sleep at 19 years and 1 month. She was one very devoted Birman who new her own mind! A cat who always had something to say, who used Skype to talk to friends overseas and was a credit to his breed. He was a pet all of his life, bred by Mavis Robson and Avril Bonney, and proudly owned by the Shaw family. Billy and his brother Harry, who pre-deceased him by 2 years (see separate entry), were bred by Nuala Leyton (Jasanbo Birmans) who had emigrated with her cats from the UK to Australia where she bred at the Jazzanbo Cattery; their parents were English Champion Jasanbo Jacaranda and Panjandrum Gilded Lily. These loving boys are sorely missed by their devoted owners Susan and Desmond Coop of Perth, Western Australia. Pr Quernmore Julius(Seal point Male 19.6.93 – 1.11.2012, Namrib Okidoki x Quernmore Powderpuff). Ch Panjandrum Sgt Pepper (Red point Male 4.10.93 – 18.12.2012, Saybrianna Tomorrows Cream x Sophanise Rosamundi). Pepper was one of Anne Madden's F4 generation Red Series Birmans in her development of these new colours and, as a well-known stud in his day, made a great contribution to the breed. He is greatly missed by his breeder owner. Ch & UK Imp Gr Pr Syralette Blushing Bride(Seal Point Female 15.11.93 – 26.12.2012, Gr Ch Shandatal Cristo Columbus x Heathfields Giddy Aunt). "Poppy" was a spectacular star of the show bench into her veteran years, breaking Birman records by gaining her UK Grand title at the age of just over 16 at the 2009 Supreme Show, when she was also Best of Variety Neuter. She is greatly missed by her proud breeder owners Sue and Ron Attley. Coco Chanelle (Seal point Female 4.3.94 - 25.5.2013, Addeilo Teleologicus x Vanbelma Bluebelle). A gentle, playful and chatty girl, with a healthy appetite and a strong constitution all her long life until she developed kidney failure in her last few months. She was gently put to sleep when her quality of life worsened and buried under a beautiful Japanese acer by her sorrowful owner Margaret Robins and her husband. Briarland Midas Touch "Dylan" (Seal point Male 18.4.95 – 2.8.2014, Ch Klassyklogs Furst Edition x Briarland Sweet Charity). Dylan's owners, Jill Ferris and family, have never had a cat that lived to such an age; he was a wonderful character and they miss him very much. He always got on very well with all their dogs – maybe thinking he was a dog himself sometimes! – and is pictured asleep with one of their Pointers, and also enjoying the garden. Holly had a much travelled existence with her devoted owner Julia Stobie and lifelong Birman companion Pippen (see 23-year-olds), living in Switzerland, Devon, Bristol, Watford, London and the Cotswolds among their many homes over the years. They both always settled in quickly and were quite at home in the car, even when crossing the Channel.. Holly was gently put to sleep without suffering after losing her battle with cancer in her 20th year and is still terribly missed. Dino was so named for the famous Ferrari model, deliberately ironic as he never did anything at speed! He lived on the Isle of Wight with John and Sue Alexander and 3 other feline companions whom he outlived by five years. A wonderful loving personality, Dino became famous among the people passing their house who were captivated by the big blue-eyed cat smiling at them, and he received birthday and Christmas cards from friends who had been to stay. He survived a major thyroid operation at 18 years old, but was then diagnosed with heart problems and was nursed by his devoted owners for a month before they had to say a heartbroken goodbye to him, in his 20th year. UK Gr Ch & UK Imp Gr Pr Tarkusha Zinfandel "Zinny" (Blue point female 28.05.1996 - 14.08.2015, Aberogwr Delph x Tarkusha Tamsin) owned and bred by Carol & Geoffrey Tarr. Although the smallest of a litter of 6 kittens, Zinny grew into a big girl and was outstandingly successful on the show bench in the days when beautiful Blue girls were very numerous. She was the first Blue point Birman (and only the second Birman in the county of any colour) to become a double UK Grand. Throughout her very long life she was as devoted to her breeder owners as they were to her. Owned by Frau Hackman in Germany , she celebrated reaching 20 with a birthday party in 1964 and died at the end of that year. The Spring 1990 Newsletter carried an item reporting that this boy (from Ch Pipo du Clos Fleuri and Paranjoti Kuomintang) was alive and well coming up to his 21st birthday, but his final age is not known. Another link with the early Birmans through her grandfather Ch Praha Dieu d'Arakhan, "Candy", owned by Pat and Bruce Forsyth (Tharawaddi) died on 21 August 2000 just 2 months short of reaching 21. A Magazine "Golden Oldie" in Spring 2001, Benjamin was the beloved companion of Susan Swann, bred by Sue and Jerry Fowler. Owned and bred by Kathleen Wall, Blue Pearl was another of the magazine's 1998 "Golden Oldies", when aged over 18. She died peacefully in her sleep at the magnificent age of 20. Jennifer Buckle's Bella had a number of Golden Oldie offspring and is shown in her photo (on the right) with her 18-year-old daughter Elkcub Champagne Cleo while working on her book "Fabulous Food for Fussy Felines". Holly was a tortoiseshell half-Birman registered as Birman type F1 and was the foundation of Anne Madden's (Panjandrum) Red Series line, through her two litters by Anne's Birman stud Gr Ch Laurant Kubla Khan. She died peacefully in her sleep aged 20 years and 6 months. "Ming" , bred by Mr and Mrs Tannock, had a long and happy life with Nina and Paul Weeks and their daughter Zoe, whose leg he would grab as she tried to descend the stairs. He also enjoyed biting toes on shoeless feet. Apart from suffering occasional fits triggered by such things as washing machine on fast spin, he was in reasonable health in his old age with no medication, and was gently put to sleep when his legs finally gave out. Bred by Jan Wedgbury, "Beau" was owner Ivy Perry's first stud cat and sired many beautifully marked kittens for her Starramia prefix. His photo is with his 20th birthday cake which he certainly enjoyed sponge, jam icing, the lot - which lasted him a week with no ill effects! His 20th birthday was celebrated with friends and a cake in the shape and colours of a Birman. Bushido enjoyed his favourite food - people tuna. This gentle sweet boy was owned by Anna Jovanovich. Elfreda Charlotte (Seal point Female 8.2.95 – 19.3.2015, Nischa Spenser x Mapuzzee Sharna). Charlotte and her Blue point litter sister Emily lived happily with Sylvia Bazley in Australia from 12 years of age when their original owner could no longer care for them, and it was love at first sight for all of them. Emily passed away 6 weeks after their 18th birthday in 2013 (see separate 18 Years entry) and Charlotte's 19th birthday was marked with her new title "Princess Charlotte" (photo in special celebration regalia). Only a few weeks before her 20th birthday she was still enjoying soaking up the sun, and she passed away 6 weeks after celebrating it with Sylvia. Adqualo Kyna Kama (Seal point Male 1.6.96 -8.8.2016, Ch Panjandrum Sgt Pepper x Danluda Tang;ed Tapestry). Affectionately known as Simba, Annette Duffy and her family were blessed to own their beautiful boy for 20 years 2 months and 1 week. His photo shows him as a young man. Ch. Shuhai Sinh Reina Mora of Myingyan Gems ( bred by Fife International Judge Adriana Bava, owned by me -Sandra Picchiello- and Myingyan Gems Birmans) lived a few days short to reach the age of 21 years old. (1994-2015) She had her moment of glory on the bench and gave birth to a few litters, going then to live a retired life with Aunt Bijou where she could watch the ocean, the seagulls and the sunsets from a cozy bed close to a pane window. Caralo Tessacherie "Pixie" (Seal point female 10.08.1998 - 6.01.2019, Adhirlo Harlequin Shamrock x Barsuanne Julie). Pixie was one of a litter of 6 kittens born in the Republic of Ireland and she lived there with David Hearne and his wife from October 1998, through many house moves, job and career changes, 4 children and getting 2 new Birmans in her last 6 months. A very loving and mischievous personality, "a gorgeous girl", she loved playing hide and seek and never lost her cool through all the family changes. She suffered some sound-induced fits in her last 18 months, but these ceased after she lost her hearing. Pixie is much missed by her owners who cherished and adored her for all her long lifetime - 20 years and 4 months. son of Ch Praha Dieu d'Arakhan, bred by Mrs Angell and later owned by Mrs Edwards. We do not have his precise dates, but he died in 2002 at 21. Ivy Perry (Starramia), owned one of his daughters, Princess Mia, who lived to 18. "Purdie", a daughter of Ch Rojodanco Arbaybi, was a much loved pet owned by Liz and Dougie Taylor, and they lost her just a few weeks short of her 22nd birthday. This remarkable 21-year old with a pale and profuse coat was from Carole Flynn's first litter (Ch Attimore Tanglepaws Tor x Jyaira Cybele) and produced the well-known Laurant Birmans Gr Ch Kubla Khan, UK Gr Ch Mood Indigo, American Gr Ch Aquarian Knight and Ch & UK Gr Pr Penny Lane - see below. Another very long-lived lady (and a "Golden Oldie" featured in the Summer 2000 Magazine), who is much missed by the Assiter-Tuppen family - Anne, John and their son Jonathan. The most famous daughter of Satinsox Bubbles, by Dearing Boy Sioux, Penny achieved many "First" titles: first Birman female Champion to become Premier, first female Grand Premier and first Birman to become a UK Grand. Carole and Des Flynn hoped so much that she would see her 22nd birthday and were very upset to lose her less than 6 weeks short of the date. Re-homed to Melva Eccles in 2001 at the age of 15, Polly nearly made it to 22 years of age like her half-sister Minx. She was the epitome of all the Birman showing/breeding faults, but will be missed so much for her inimitable character and the love that she gave. We don't have Blue's pedigree name, but he was from very famous parents, Carol Flynn's Gr Ch Laurant Sugar Dandy and Satinsox Bubbles, and lived for a wonderful 21 years with Graham Luteman and family. Mo's precise age was never known by her last owner Jill Thomas of Cornwall as she was a rescue Birman who was first re-homed to Jill's mother from the PDSA at 8 years old, because her owners could no longer care for her. She went to live with Jill after her mother's death two years later and settled quickly with a Chinchilla kitten. At 18 she began having fits every 3 or 4 weeks, but these ceased after she became deaf and couldn't hear any noise, and she finally slipped away from old age in June 2008 at nearly 21 years old. Bred by Bruce and Pat Forsyth, "Mushroom", as she was known to friends and family, spent her later years with their daughter and son-in-law after retirement from motherhood and showing. She had the distinction of becoming a UK Grand Premier at 14 years and 1 month, a record age which is still held for achieving this title. She passed away just 2 months short of her 22nd birthday, having enjoyed celebrating her 21st birthday in 2006 with a special cake. Bred by Marcia Owen. Ben was the much loved pet of Gloria & Andrew Barclay who gave him such a lovely home for his nearly 22 years. He never wanted for anything. Ben died just 22 days before his 22nd birthday. "Audrey" as she was know at home, was bred by Mrs Frances Clarke and owned and loved for her long life by Carol Lohoar and her family. She slipped away in her 22nd year. Lucy came to live with the Barley family for 21 years. She was loved very much and is greatly missed. She was a friendly, affectionate and intelligent cat with a real zest for life. In later life she was still active, patrolling her house and garden and seeing off any other feline interlopers. Sadly she had to be put to sleep after a long illness with kidney disease. Charlsim Cappuchino "Puss" (Seal point Female 28.10.1986 – 6.5.2008, Gr Ch Hilken Flambeau x Tranquil Pussywillow). Bred by Mrs Gwen Tapsell, "Puss" was a very gentle, feminine and sweet girl who nearly died when young due to an inner ear infection. Her devoted owner Joy Macey writes that after the operation for that, she held her head tilted, became cross eyed and lost some balance – giving the impression of being sweet but not strong, belied by her great age. Livewyre Candice "Candy" (Blue point Female 9.6.1994 - 15.7.2015, Adhuilo Petro Paddy x Livewyre Kotton Kandi). We lost our gorgeous girl Candy at the grand old age of 21 years and 5 weeks. She was diagnosed with renal failure almost over 4.5 years ago so we are amazed she got to such a ripe old age. We are heartbroken to lose her. Menyang Pearldrop (Blue point Female 8.12.1994 - 24.5.2016, Sandgrounder Samkin x Wyeview Danielle). Pearldrop lived for all of her 21 years and 168 days with Brierley and Robina Stubbs and their three sons, as their cherished treasure with royal status. In her old age she suffered from sound-induced fits and gradual kidney failure and in her last months became both blind and deaf, and family life revolved around her comfort and welfare. The Stubbs family say "Broken hearts will mend and sweet memories of our little Pearly will last for ever.". Chillon Nicolette "Yoko Bear" (Seal point Female 27.01.1995 - 19.06.2016, Aust. Gr Ch Sarika Choclatier x Badarene Katisha.) One of our overseas Veteran Birmans, Yoko lived in Perth, Western Australia with Jessica Cristiano and her family. They named her "Yoko" as a kitten to suit her quirky vivacious personality. She conquered bowel and renal problems in her later years but then suddenly lost the use of her legs and could no longer walk With the realisation that she could have no quality of life, she was put peacefully to sleep with no pain with all her family by her side. She lived a total of 21 years, 4 month and 23 days - in the hearts of the Cristiano family forever and dearly missed. Jandouglen Hi-Jinks "BARNEY" (Blue Tabby point male 11.04.1994 - 27.04.2014, Julipaul Tarragon x Adhuilo Tamsin). Barney, whose moving story was featured in the Summer 2015 club magazine, came into the care of Birman Welfare & Rescue at the age of 16. He spent the rest of his life in the loving home of Alison and Stuart Cracknall, and Birman Rescue companions Lucy Lu (see 22-year-olds) and Taffy. He always sent Rescue & Welfare Co-ordinator Angie Walker a Valentine's Day and Christmas morning greeting every year, and an extra special message on his 21st birthday. Adhirlo Bluebell Karima "Bluebell" (Blue point female 15.05.96 - 13.03.17, Caranida Champagne Charlie x Adinnlo Corshca). Bluebell lived with us, her Mum & Dad Sue & Tony Billows for nearly 22 years. Bluebell charmed all she met with her beautiful, warm and loving personality. Her health and zest for life was wonderful . She travelled all over the UK with us, to friends, family, hotels and our holiday home. She was Queen of our Hearts and will always be with us. After a few months of illness, she passed away peacefully in our arms aged 21 years 9 months and 28 days. Blossom lived her life with John and Anne Assiter-Tuppen and their son Jonathan. Born in May, they named her additionally for the May blossom which was in bloom on the day one of their beloved first Birmans died. Their "bold, bad and beautiful" Blossom was, even in her advancing years, a naughty girl at times: an accomplished thief who regularly stole the biscuits for their Shih Tzu dog. 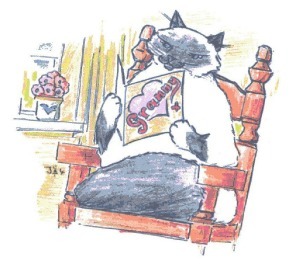 Blossom and her late Seal point companion Sugar (Allslee Sugar Puff – see above) were the inspiration for many of the wonderful Birman drawings John has done over many years to illustrate features in the Club Magazine, and they are heartbroken that for the present they don't have the blessing of a Birman in their lives. "Peter" was extra special to Jean Ball and her family and he is still much missed. They had a caravan in Cornwall so they could share their holidays with Peter and their other Birmans, and his photo shows him there in his favourite resting place. Lulu and her litter brother Sam, who died at the age of 21 (+ one month), were owned from kittenhood by Sandra Prior and bred by Eileen Chalk of the Verlam prefix (sired by Ch Shimron Lucius). Lulu was nearly as old as Peter above, at 22 years, 2 months and 14 days, and her photo was taken a month before she died. Charmy of Ontario (BP male 1.10.85 - 11.11.07, Hasseliden's Blue Julia x She Toung's Maximillian): Bred by Norwegian breeder Turid Botten, Charmy lived with Asbjorn and Signe Lykka - a child to them and spoiled as only a child can be. They would only holiday in their log cabin in the Norwegian countryside so that Charmy could be with them! On his 22nd birthday, featured in the local paper, breeder Turid presented 22 red roses to his owners, one for each year of his life. He passed peacefully away while asleep on his owner's lap, at 22 years, 1 month and 10 days old. Lucy-Lu (Seal point female 4.06.94 - July 2016). A Rescue Birman, Lucy Lu lived in the loving care of Alison and Stuart.Cracknall. She shared several years of her life with Barney, another Rescue Birman (see 21-year-olds) and with Taffy (photograph taken with him in January 2016), also a Rescue Birman aged 18 at the time of her passing at the age of 22 years and 1 month. Minx was from Shirley Talboys' third Birman litter and lived all her life with devoted "staff" Shirley Hartnett and Douglas Mensforth of Herefordshire. In her last years she was lively and loving, with a thick coat and ruff and no health problems. She was still able to bounce onto the bed when she celebrated her 22nd birthday with cards from friends, and still enjoying her daily tours of their lovely garden when she reached the record 23, again with a postbag of cards. She lived for a wonderful 23 years, 5 months and 2 days. On her last day she had a huge breakfast of trout and lamb and hake and cod and later, while at the vet's, had another meal and a walk in the practice garden which she took the opportunity to make her own. She was buried in her beloved garden with her 23rd birthday present toy spider to accompany her to Rainbow Bridge. Pepsi (28.02.1988 to 06.06.2011, Seal point female 28.02.1988 - 06.06.2011, Pandelo Blue Briar x Shoonahs Joanna) Pepsi was 23 years, 3 months and 10 days old when she died. "She had not been well for some time and she was lucky to reach her 23rd birthday. Since we e-mailed last August she survived building works in the house when we had the kitchen extended. This involved moving her tray and food into the living room , almost next to her bed on the settee. This went down very well with her and we referred to it as her "en-suite"! Once the kitchen was complete we kept her "en-suite" in place. We then had to include a step eventually for her to get up on her bed as this was getting more difficult, but she was clever enough to work out straight away what this was for. She also developed a habit of sitting on the settee and shouting for her water to be brought up to her. We started referring to her as the Queen Mother! We eventually had to make the difficult decision to take her to the Vets after she lost such a lot of weight, even though she was still eating. We both miss her very much but are so grateful to have had her for all those years." Very much missed by Sue and Melvin Chatfield. Pippen had a much travelled existence with her devoted owner Julia Stobie and slightly younger Birman companion Holly (see 19-year-olds), living in Switzerland, Devon, Bristol, Watford, London and the Cotswolds among their many homes. They both always settled in quickly and were quite at home in the car, even when crossing the Channel. After Holly died from cancer in 2013 Pippen remained fit and well and continued to shout the house down if she wanted something and jumped onto the bed for a cuddle every night. Pippen went to Rainbow Bridge in Julia's arms in her 24th year, at the record age of 23 years, 6 months and 24 days. making her the oldest Birman by around 7 weeks that we know of in the UK. Both Pippen and Holly are grievously missed.